If you want to know the purpose of a salesperson, just ask a customer. The customer will tell you a salesperson’s purpose is to help him or her make better buying-decisions. Isn’t that what you also think when you’re in the customer’s role? The million-dollar question is, how many salespeople are mindful of this? Many salespeople have a different agenda. Their agenda is to sell products to customers. Do you see a problem brewing? The customer’s goal is about their buying; the salesperson’s goal is about their selling. However, customers want their salesperson’s goal to also be about buying. 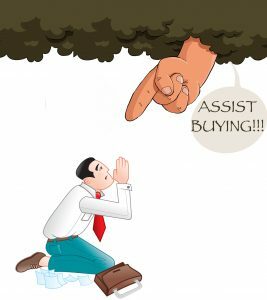 It’s no wonder salespeople are stigmatized as being pushy and assertive. Conflicting goals lead to bad teamwork. distracting. Customers should be weighing the pros and cons of buying. Instead, their attention is diverted to what salespeople are trying to get them to think. The harder salespeople try, the more of a distraction they become. Customers will be busy dealing with the salesperson rather than dealing with their decision-making. The Internet brings this issue to the forefront. Customers can now opt to buy on-line without any salesperson interaction at all. The once indispensible benefit salespeople can offer, product knowledge, is available on-line as well. Even product reviews can be easily accessed on-line. This leads to the inevitable question, what’s left for Salespeople to offer customers? Interestingly, it’s what customers have always wanted from salespeople- help with their buying-decisions. Now, more than ever, Salespeople will benefit from understanding how to do this well. And step one, is to be mindful of your purpose as a key player on your customer’s buying-decision team. Salespeople need to get on their customer’s team and help them make better buying-decisions.